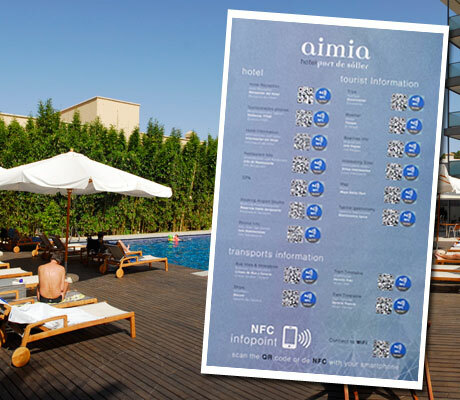 The Aimia Hotel in the resort of Port de Sóller, Mallorca, is using NFC to provide information on local services to guests via a tap of a mobile phone. A printed panel containing NFC tags, designed and managed by NFC and social media solutions provider GeoCrono, has been placed in the hotel’s reception area. Guests can tap to access information about public transport, places to visit and weather forecasts as well as downloadable maps, the hotel’s WiFi password and its restaurant menu. The panel is expected to reduce “cost and unnecessary queues at reception”, GeoCrono says, and “enhance the guest experience.” The panel also includes QR codes for guests without NFC phones.